Android SDK Offline: How to Install Android SDK Offline? Android SDK has it owns SDK tool called Android SDK Tools. This is the tool that responsible for installing, downloading , updating and managing all the entire SDK packages. What you need to now is , the SDK Tool itself has updates on its own. 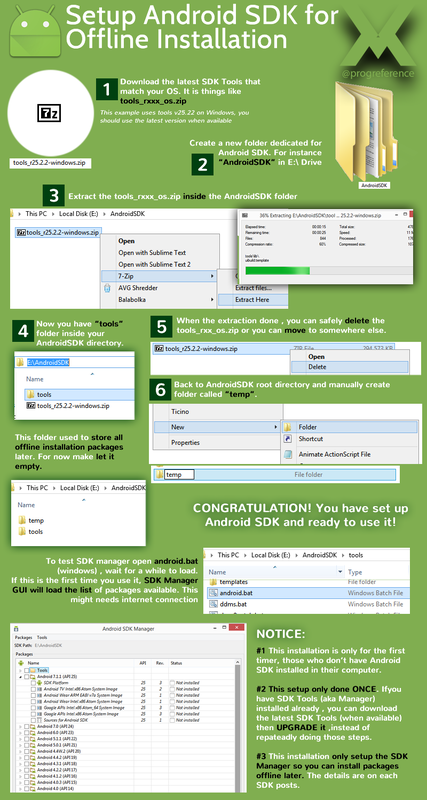 Create a new folder dedicated for Android SDK. For instance "AndroidSDK" in E:\ Drive This folder will store all SDK installation packages. You can use whatever folder you want .. Just make sure it is accessible for you. Extract the tools_rxxx_os.zip inside the AndroidSDK folder This could take seconds or a minute . You can use apps like 7-zip, wiinrar , etc. Now you have "tools" folder inside your AndroidSDK directory. Back to AndroidSDK root directory and manually create folder called "temp". This folder used to store all offline installation packages later. For now make let it empty. Now, the basic setup for SDK Manager has been done. Congrats! For Complete Demonstration on how to install Android SDK , including packages , check out this video below. This is a common guideline video for installing Android SDK Offline. It uses Android 5 as the SDK example that being installed, However these process is common and can be applied to install other SDK Versions from 4,5,6,7 and also the SDK tools. Follow the video for detailed instruction.